Priyanka Chopra was briefly in Mumbai for the Christmas holidays and now, the actress has jetted off to London to ring in New Year 2018. But this time, Priyanka has her family in tow and not her professional team because it's party time for the New Years! 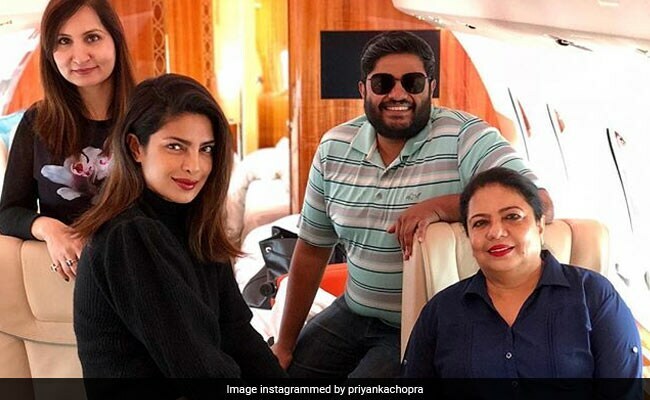 In photos shared on social media, Priyanka, her mother Madhu Chopra and brother Siddharth, can be seen seated in what appears to be a private jet. The Chopras were headed to a "winter wonderland", and in case you are wondering where that is, hear it from Priyanka Chopra herself: "I guess it's gonna be a winter wonderland.. London here we come," is the caption she wrote for her vacation-ready photo. "Just casually posing while watching the game! Cause our team won," she wrote for her photo. One of the things that was on Priyanka's London check list was to attend the English Premier League and she had it checked off. As bonus, Priyanka got to cheer for one of the winning teams - Chelsea. Priyanka being Priyanka, always has time for a good photo and here's the memory she documented at the football stadium. It's so good to see busy star Priyanka Chopra vacationing with her family - the star shuttles between India and New York (where she spends most of the year because of work commitments) throughout the year. She's headlining the popular US TV show Quantico, whose third season is currently in the making. Apart from her television project, Priyanka also has Hollywood films - Isn't It Romantic? and A Kid Like Jake in the pipeline. Back home, she was last seen in 2016's Jai Gangaajal and has not announced her next Bollywood project yet.